Machaelle has written a very big new book! "I just finished Pivot, and WOW what a read! Even though I have read every other book Machaelle has written, this was fabulous and had so much new information in it." We've been lucky enough to be among the few who have read Pivot. It opened our minds and hearts to a better understanding and appreciation of our lives, our world and the universe beyond. We have worked at Perelandra for over 25 years, and have read all of Machaelle's books multiple times. Still, we found this book riveting and new. Whether you've also read them all or haven't read any yet, you'll find Pivot to be an experience unlike any other. Machaelle takes us on a deeply personal and insightful journey from her beginnings through to what she's doing and thinking now, over 70 years later and after having founded Perelandra nearly 40 years ago. She looks ahead to her pivot-woven future, and reveals what's in store for her, and for Perelandra. If you have been looking back and thinking about your life lived so far, Pivot will give you a fresh perspective, a way to find new meaning and understanding in your own journey. If you are looking ahead to life in front of you, Pivot will inspire you to make the most of your adventures, opportunities and choices. 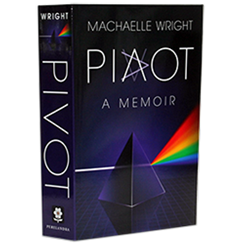 Pivot is more than a memoir about an extraordinary life. It's about life at its largest and what can happen when we recognize the unique possibilities in our own journey — our own life at its largest. 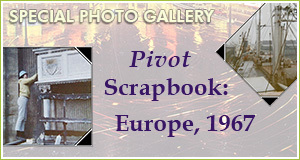 Think you know what the word "pivot" means? Think again! A pivot occurs when a person who has been traveling on a familiar, well-defined life path makes a sudden voluntary or involuntary turn that untethers the individual from that path and propels him or her onto a new and often unrelated path that uproots the individual from his or her previous world. Now, when we say "very big" book, we aren't kidding around. It's 848 pages. It's a rather thick 6x9 inch softcover book. It's as rich and inspiring as it is hefty.